WASHINGTON — As House appropriators approved a spending bill May 17 that partially restores funding for a NASA astrophysics mission slated for cancellation, the agency’s administrator said he was “90 percent” confident that the mission will continue. 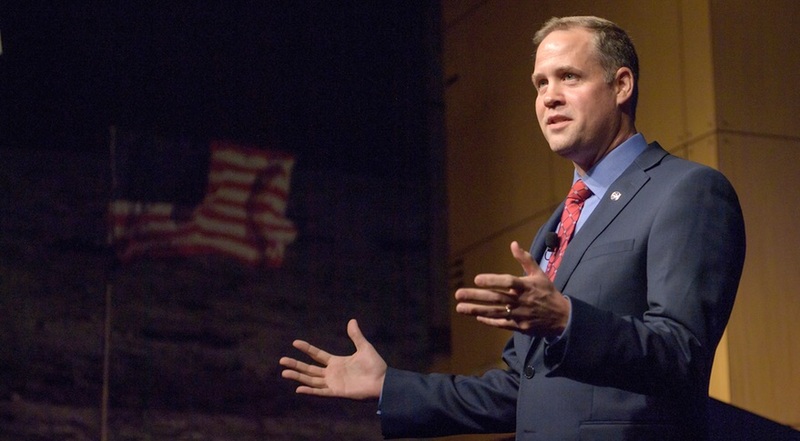 Speaking at a town hall meeting at NASA Headquarters, Jim Bridenstine said that despite being targeted for cancellation in the administration’s fiscal year 2019 budget request, he expected the Wide-Field Infrared Survey Telescope (WFIRST) to win funding from Congress and continue. The administration’s request, issued in February prior to Bridenstine being confirmed as NASA administrator, offered no money for WFIRST, citing a desire to spend money previously planned for it on other programs. At the time, WFIRST was working to reduce its estimated cost to $3.2 billion after an independent review board last fall found that it was several hundred million dollars over that estimate. House appropriators, in a report accompanying their commerce, justice and science (CJS) spending bill released May 16, instead offered $150 million for WFIRST. That is the same amount that the mission received in fiscal year 2018, but only half the $302 million NASA’s 2018 budget request estimated WFIRST would need in 2019. He hinted that he would support smaller missions over large strategic, or flagship, missions like JWST or WFIRST. “If we can do smaller missions with multiple satellites, then any one of them that runs over doesn’t clobber the decadal [survey] not only for this decade but also the next decade,” he said. He didn’t address how the scientific questions that, in many cases, require the large apertures or instrumentation associated with flagship missions could be done with smaller telescopes. As Bridenstine spoke, the House Appropriations Committee marked up the CJS spending bill. The committee favorably reported the bill 32–19 after a five-hour session, without making major changes to the NASA provisions of the bill. Only one amendment addressing NASA programs was debated during the session, and at the very end. Rep. Dutch Ruppersberger (D-Md.) introduced an amendment to secure $161 million for the Plankton, Aerosol, Cloud, ocean Ecosystem (PACE) Earth science mission, one of four targeted for cancellation in the administration’s request. He cited in particular the importance of the mission in monitoring the environment of the Chesapeake Bay region in his statement supporting PACE. Ruppersberger, though, withdrew the amendment. “I just wanted to get it on the record that this is an important program for NASA,” he said. Rep. John Culberson (R-Texas), chairman of the CJS subcommittee, said he would work with Ruppersberger in the weeks ahead to address his concerns about funding the mission. Bridenstine made similar comments at his Senate confirmation hearing last November. “Human activity absolutely is a contributor to the climate change that we are currently seeing,” he said then, although he declined to say if it was the primary cause. He didn’t explicitly state at the town hall meeting that human activity was the primary cause for climate change, only a major one. The appropriations bill that the House ultimately passes with have to be reconciled with a Senate bill yet to be developed. Senate appropriators are scheduled to hold a hearing on NASA’s budget proposal May 23 and take up their version of a CJS spending bill the week of June 11.